I was interested to see this post complaining about Brisbane bus services to the University of Queensland. In this Courier Mail article it appears that the most overcrowded bus services in Brisbane all serve university precincts. 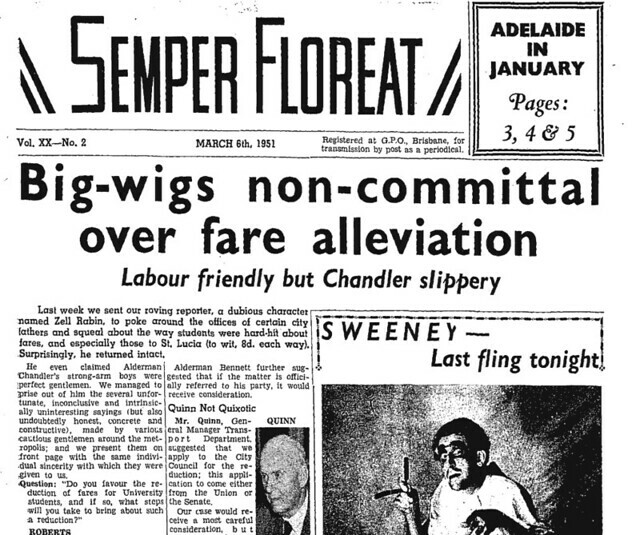 My dad was editor of the UQ student newspaper Semper Floreat in 1951. UQ has recently put many (possibly all) old editions of it online. To my surprise and delight, I found that he put a series of front page stories about the UQ bus services into several editions of Semper, highlighting crowding and in particular the lack of concessions for university students. We know that students at the southern universities get fairly generous concessions. And as the University of Queensland is scattered all over the face of Brisbane, we think we deserve them even more. We also consider that, with full bus-loads guaranteed, the City Council could afford to reduce the St Lucia fare piecemeal. In a follow up article on May 15th, Semper reported that a student delegation to the council with little result, and pleads for the students as a whole to make some noise about the issue in the hopes of getting it resolved. These days, fulltime tertiary students in Queensland do get a 50% concession fare. Dad never told me about this. 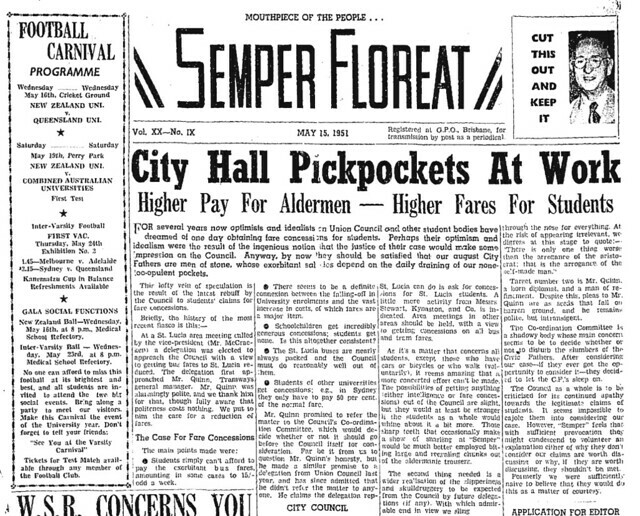 Of course, there were others involved, and Semper took on many causes, but I find it fascinating that 61 years ago he was campaigning on this particular issue. There’s something in the blood, eh? ← Previous Previous post: What’s so special about this block of flats? An interesting point to note is that the Queensland concession seems to apply to post graduate students, however Victorian student concessions don’t. Perhaps the Victorian Government considers post-graduate researchers to be rich with funding money, or perhaps significantly older than undergraduates? As a post graduate student studying for my PhD, I can say that this is hardly the case! In fact, grants usually limit students funding to levels… i was making more money doing casual retail work during full time undergraduate studies then with my full time post graduate studies! So to save costs, I ride my bicycle daily about 17kms each way along scotchmans creek trail/gardiners creek trail and Main yarra trail (my local train line is Glen Waverley). My travel time is about 15 minutes longer than on the train. Fascinating to read the above, Daniel. At the time, it was proposed to convert those crowded diesel bus routes to trolley buses running to the university via Coronation Drive. A fleet of 30 Sunbeam trolleys was ordered for the route. However the Nimbys of the day objected to overhead wires along Coronation Drive, and the trolleys were installed on other routes. Eventually there were five trolley bus routes, operated out of the depot in Milton which was close to where the St Lucia route would have been, but far from the actual trolley bus routes. Brisbane’s trolley buses — a minor part of the city’s transport system — ran for the last time in March 1969, a month before the greatest act of civic vandalism in Australian transport history, the closure of Brisbane’s fine, modern tramway system. The newest Brisbane trams were just five years old when Labor mayor Clem Jones destroyed the system because he wanted working people to drive cars like the toffs, but the trams were so good even car-owners used them. Melbourne’s newest tram in 1969 was already 13 years old. Coronation Drive today is a traffic sewer that has ugly metal gantries along and above it for the traffic lane flow and contra flow arrow lights, far more visually intrusive than trolley bus wires.